Open-face cabinets are appealing to people who like the idea of creating the impression of more open space in their kitchens, offices, bedrooms, home offices or libraries. Open-face cabinets can have glass doors or no doors at all. Either way, the idea is to reveal the contents of the cabinets. So for many people, the appeal of open-face cabinets is to display the contents of their shelves. Such an approach can be especially appealing for people who love books or who want to exhibit trophies or specialized collections. Of course, what is displayed on the shelves of open-face cabinets is as varied as the people who have them built and installed. Open-face cabinets do a great job of showing off what you love and sharing your unique range of interests. Open-face cabinets do not always need to be only for displaying items. They can be more functional and hidden away. For example, if you are interested in making better use of space in a walk-in closet or a small side-room, open-face cabinetry, when designed by a creative and capable builder like Danner’s, can allow you to store an enormous amount of items. More importantly, when that kind of cabinetry is installed, you not only can store a lot in them, you can create a lot of space in more high-traffic areas of your house. 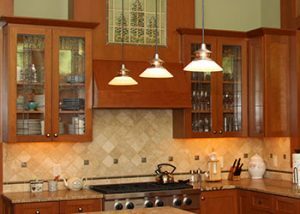 When you work with us at Danner’s Cabinet Shop, your cabinetry will be expertly built and installed. You can count on that whether you select a more decorative style or a more functional style. High quality is our starting point, and it is something we have never, and will never, compromise on. Our customers deserve nothing less than our best effort, and that is exactly what we have given to them for the last fifty years. We know that you take great pride in your home. So, we are happy and honored to work closely with you to ensure that the design you select meets both your functional needs and esthetic desires. Cabinetry, after all, serves the purpose of storage. But it can also give your home the specific, unique appearance you want it to have. If you would like to discuss options, contact our team by phone at 763 753-4002; or you can send an email to troy@dannerscabinets.com.